Hi all. 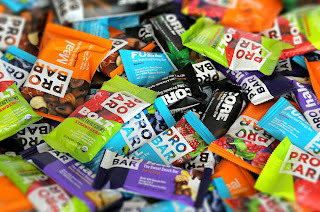 October is Non-GMO Month and I wanted to share with you an awesome giveaway as well as information about Non-GMO Month. 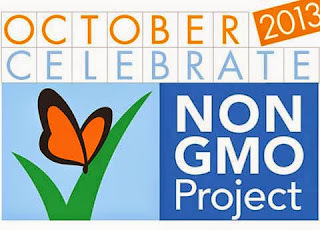 Non-GMO Month was created by the Non-GMO Project in 2010 as a platform for raising awareness on the GMO issue. Citizens and organizations across North America are waking up to the failure of GMO technology, and discovering the risks GMOs pose to our health, our families, and our planet. Non-GMO Month is an opportunity to coordinate our voices and our actions, so that we can stand up loudly and clearly for our right to know what’s in our food, and to choose non-GMO. Protecting consumer choice and a non-GMO food supply require a multi-faceted approach and lots of team work, which is why this website was created. Together, we make Non-GMO Month happen by creating and participating in events, and spreading the word in our communities. There are lots of ways to get involved. Make sure your local natural foods store is registered for Non-GMO Month, and pledge to choose Non-GMO Project Verified foods for the month of October. Got another idea? Make it happen! Register your event here. Choose food and products that are Non-GMO Project Verified! Click here to see a complete list. Today,130-year-old McCormick Canada is the largest spice, dry sauce and seasoning extract and specialty food operation in the country. The largest of McCormicks brands is Club House which is now the 54th largest brand in Canada. Club House has created new gluten-free certified products to support this baking and holiday season! I had the pleasure of trying out the new Gluten-Free Turkey Gravy by Club House. It was great to see that this company is offering gluten-free products that are well-priced and taste fantastic. I have a lot of friends and family that follow a strict gluten-free diet so they were more than excited to see that I came across gluten-free gravy! The Club House Turkey Gravy was very flavorful and accompanied my turkey and stuffing quite nicely. It wasn't too salty or watery but just the perfect amount of texture and flavor. 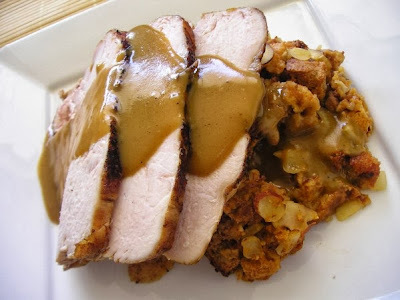 You can easily make a lovely Thanksgiving meal that is gluten-free by pairing this gravy up with turkey and a gluten-free stuffing. Add in some roasted carrots and brussel sprouts and you're good to go! Toast bread cubes carefully in a preheated 300°F oven for 20 minutes or until dried, stirring occasionally to promote even browning. If using Gluten Free Bakehouse stuffing cubes, skip this toasting step. Sauté shallots, onions, celery and carrots in butter until they are soft and onions begin to caramelize. Add sage, thyme, salt and pepper and cook over medium heat for 2 minutes. Add wine and continue cooking over medium heat until liquid is reduced by half. Prepare gravy by following instructions on the package and serve warm over stuffing. Don't forget to check out their social media pages as well for some great recipes and information!